WHAT: Dedication of Little Free Library at Park Place Outreach. The new Little Free Library, painted by local artist Kimberly Dawn Crowder, will be part of the Flannery O’Connor Book Trail, which runs from Savannah, Ga. to Milledgeville, Ga. Little Free Libraries encourage anyone to take a book and leave a book. 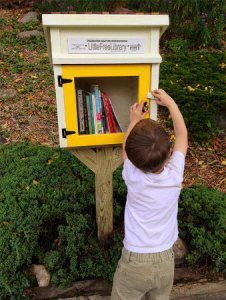 The concept originated in Wisconsin in 2010 and has since blossomed into a network of more than 20,000 miniature libraries around the world. The dedication ceremony at Park Place Outreach will include a special tribute to the late Francis Allen, the co-owner of Savannah’s Roots Up Gallery who started the Flannery O’Connor Book Trail in 2014 along with his wife, Leslie Lovell. The installation of the new Little Free Library and the continuation of the Flannery O’Connor Book Trail is made possible by contributions donated in honor of Francis Allen upon his passing August 30, 2017. In addition, the Downtown Garden Club of Savannah has donated time and effort to restore the garden at Park Place Outreach where the Little Free Library will be installed. NOTE: Members of the media are welcome to attend. Interviews will be available on-site with representatives from the Flannery O’Connor Childhood Home, Park Place Outreach and the Downtown Garden Club of Savannah. Park Place Outreach is a 12-bed temporary residential shelter for runaway, homeless and at-risk youth ages 11-17, centrally located on Henry Street in Savannah. Opened in 1984, the shelter offers youth a safe and loving environment, with 24/7/365 care by a staff of house parents and case managers. Park Place Outreach is the only facility in Savannah where homeless, abused or runaway teenagers can self-admit without an agency or parent referral. The organization’s goal is to keep kids off the street and reunify families. Park Place Outreach Youth Emergency Shelter is an equal opportunity provider and employer. With the generous support of local organizations and individuals, the Park Place Outreach Shelter has helped more than 6,500 individuals. For more information, please visit parkplaceyes.org or Park Place Outreach – Youth Emergency Shelter on Facebook. The Flannery O’Connor Childhood Home, located at 207 E. Charlton Street in the heart of Savannah, Georgia, is dedicated to preserving the legacy of one of the South’s greatest writers. An established 501©(3) nonprofit organization, the Flannery O’Connor Home Foundation, Inc. has meticulously restored the author’s childhood home to reflect the authentic period furnishings of a Depression-era Savannah row house and to offer insight into the years that O’Connor lived in Savannah, from 1925 to 1938. The Home proudly presents a series of free lectures as well as other events throughout the year. For more information, please visit flanneryoconnorhome.org or call 912.233.6014. Flannery O’Connor was born in Savannah, Georgia on March 25, 1925 and is the author of the acclaimed novels Wise Blood and The Violent Bear It Away, as well as 32 short stories and numerous essays. Best known as a pioneering Southern gothic author who often wrote about morally flawed characters, O’Connor remains an important voice in American literature. She lived in Savannah until 1938 and drew inspiration from her childhood experiences in Georgia’s First City until her death from lupus in Milledgeville, Georgia on August 3, 1964. She received the National Book Award for Fiction posthumously in 1972 for The Collected Stories of Flannery O’Connor.